Keeping fit and staying in shape can be accomplished through water aerobics. It’s an aquatic type of exercise that is recommended to elderly people. It’s very helpful to them, since they have fragile joints and bones which are prone to impact on land types of exercise. Making it an ideal exercise for the elderly people ages 60 and above. 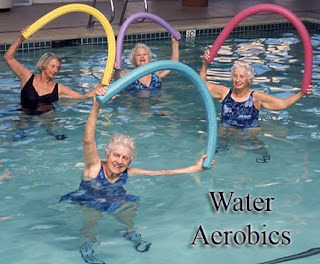 Water aerobics utilizes swimming pools and equipments for the basic exercises of the elderly. The activities take place in the shallow ends of the water which ensures their safety. Professional fitness trainers would give out stretching routines first so that the muscles would be warmed up. In this manner, the muscles would be able to burn calories more efficiently. The most intense portion of the workout is the middle part wherein most of the calories are burned. Kicking of the legs, walking, and running in the water are going to be instructed by the trainers. But it doesn’t mean that the elderly would be required to swim because the idea here is to simply move their body in the shallow water. Although the said routines may sound simple, yet it is very efficient in sweating out toxins from the body. Floatation devices, free weights, and the ones attached to the body of the elderly would be used in the activity. In about 30 minutes or more, as much as 500 calories would be eliminated from the body because of this strenuous but low impact exercise. Water aerobics deploys fitness workouts which would guarantee burning of fats, calories, and toxins. It is also a good way for the elderly of meeting and interacting with other people.